I have been a long time fan of Spencers and the NichePursuits audience, and up until recently (~6months) I had a demanding day job and had to focus on building systems to be able to operate my online business. Leveraging systems for creating great content I have built up my portfolio of websites to earn over $14k/month and I have left the day job to pursue my online ventures full time. This is a giant guide but I will try and make it as actionable as possible! 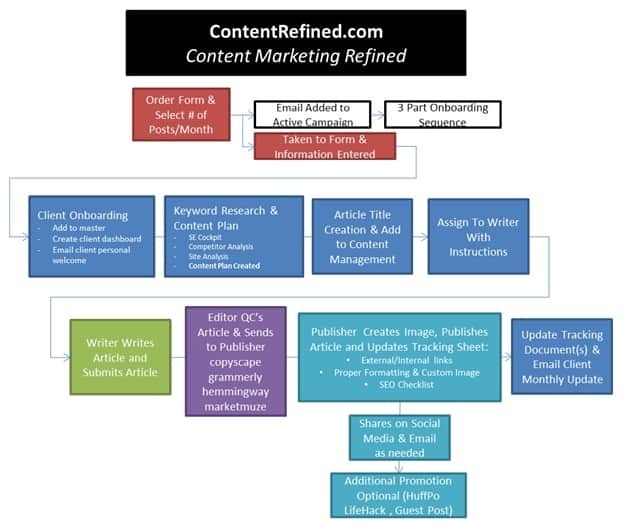 In this post I am happy to reveal here many of the article briefs and SOPs we created as part of launching ContentRefined into a leading done for you content marketing service. This post is a MONSTER and I hope it doesn’t overwhelm you as everything that we do gets shared. If you are a website owner like me, you understand how difficult and time consuming it can be to maintain your sites, producing and publishing consistent content is tough! Over time, I have accumulated over 60 active money websites, most of which are affiliate sites, blogs or FBA businesses. Although this portfolio of sites is still really fun to build out and make money off of, other aspects of my online business have really become a large focal point and I have less and less time to spend on my site portfolio. With the number of projects I have (fellow willing sufferer of the bright shiny object syndrome like Spencer), in order to achieve sustainable I have to be crazy focused on systems! Although all of my sites are a little bit different, a major commonality they share is that they all require great content marketing to sustain/grow. As you know, the quality of your content is something that is becoming more and more crucial to any site as Google keeps raising the quality bar and finessing their algorithms. Because of my many projects I hired a new team member to help me run my money site portfolio and specifically focus on creating the systems to publish great quality content. I wanted more than just help maintaining my sites, I wanted my portfolio to have solid processes in place to ensure systematic quality without feeling like I had to do much myself. It originally took a few months of really hard work, messing with different content marketing tools, and making a ton of mistakes to figure it out, but we have been able to create and execute a company SOP around systematic, high quality keyword research, content creation and content publishing. As a result, we have noticed that our rankings have been consistently increasing and the portfolio is experiencing pretty solid and consistent growth (as shown below from my income report). As the site portfolio management started getting more and more efficient with this SOP, we saw potential for expansion as the need for quality content is a common problem for not only myself, but also for most site owners. I pitched this idea (done for you content marketing) to a few members of my list, and as a result we got a few beta testers to see if the service would actually work for their sites and if they would see value in our processes. After a few months of tweaking our procedures and figuring out where our sore points were, we launched Content Refined, a one stop shop solution for your online content. Now this blog post is all about sharing the tools, SOPs and insights created/learned in the creation of this system. We truly believe that good quality content creation is attainable for everyone regardless of budget and we would like to share some tips, secrets and even some of our documentation with you so that you can either do it yourself with your own team, or choose to try out Content Refined if it makes sense for you and your business. The next section will show you how to SYSTEMATIZE and OUTSOURCE EVERY STEP in the process! If you want to create your own content using the Content Refined process, your best friend is going to be Upwork. Upwork is a great platform to hire a small team which should consist of at least one writer and a Virtual Assistant. Hiring consistent and high quality writers is an ongoing battle and something that we are constantly doing- However, we have managed to build up a really good core team of writers that have been with us for a long time and who produce a lot of content for us on a monthly basis by following our Hiring SOP and keep reading to see exactly how to do it on upwork. Keep them consistently working! No freelancer wants a dry week. This is their livelihood and they will prioritize another client over you if you don’t have consistent work for them. Make sure you have a system in place to manage their output and that you give them great instructions and feedback! Here are the General Instructions we give potential candidates for their test articles! 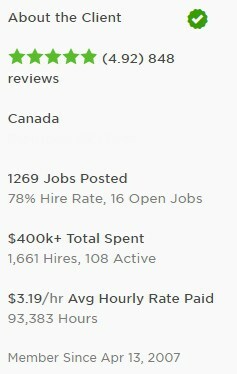 Note, me and my team have A LOT of experience on UpWork with 1,661 hires and over $400k in lifetime spend! So the tips above and below have been hard earned. Step 7: Click “post job”. DONE! You’ve posted your job! Budget: Does the bid fall within the budget that you specified? They have to be North American. Either from the USA or Canada. We’ve struggled with international writers with language capabilities, time zone changes etc.. The best writers for our business have consistently been from North America and educated in North America. TIP – In a world where hiring and firing has almost no cost the risk you are mitigating with an interview is not worth your time. Hire fast and fire fast! Step 5: Make sure the budget is deposited and give them 3 days to complete their first test articles using these General Instructions. Step 7: It’s time to make a decision and use your judgment in hiring/firing decisions. If you like what you see then give them a shot and you’ve got yourself a new writer! TIP – Tools like MarketMuse or Grammerly can help systematize your evaluation of writers. Now it is time to keep building your content creation team. Just a writer is not enough if you want to build a team to execute the entire strategy! Let’s face it, Keyword Research and Content publishing can be complicated, technical and very time consuming. To understand the fundamentals of Keyword Research, check out the Longtail Pro University course for a really great, in depth look at how to do great Keyword Research. For more technical tasks such as Keyword Research and publishing, I have traditionally hired a talented virtual assistant to help me with this. Now hiring a VA can be tricky, but for anyone who is trying to build up a good website or online business, I believe a VA is essential. 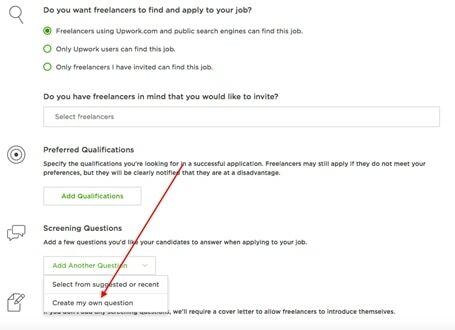 Read below for a step by step guide to finding a qualified VA quickly on upwork. Here I will put down the requirements for each task that I need completed in the job description. Step 5: Click “post job”. The general rule of thumb is “the more hours the better”. What can happen a lot is that someone will sign up on UpWork, apply to a job but then just never complete the assignment. Someone who is dedicated and who has a career in freelancing on UpWork will absolutely deliver results for you as they will want to ensure that they will be receiving positive feedback and future work. General rule of thumb on this one is that if someone is below a 4 rating I would stay away. Reviews are useful to read but don’t take one negative review too seriously if they have many positive reviews as well. In my case I am generally looking to find someone who has done this kind of work before. WordPress experience is a must, whereas for keyword research this is something I am willing to teach based on my own preferences. Communication is essential to this business and I want to find someone who does not have any broken English in their application. What I’ll also do is send them a message via upwork and try to have a real time conversation with them in order to assess their English. The best method that I have found is to do a blind experiment with my VA’s instead of an interview. In real life, the costs of making a hiring mistakes are high. In the online world, ending a contract only costs a few hours of work. You can save yourself tons of time by not doing interviews. Assign each VA a short term publishing assignment and a short terms Keyword Research Assignment. It is important to send the instructions and assign the tasks right after you have hired them. The assignments I am looking to assign are going to be something that is simple and but that will test them on skills sets that are required for the job. The most important first step of the review you’re going to have of them is the initial communication. Questions are great- but in this case, the tasks I need completed are going to be simple and if they actually have the experience that they said they have, I shouldn’t be getting a ton of emails asking simple questions like “how do I save a post to Draft Mode” or anything they could easily learn on Google. If they do, then they will undoubtedly be a burden on me. If they are able to execute the tasks I give them properly, in a timely fashion, and without much guidance, I know that they will be good fit. Using this method for testing VA’s has saved me so much time and has been a huge help to me and my team in terms of weeding out low performers without spending too much time on it. CONGRATS! 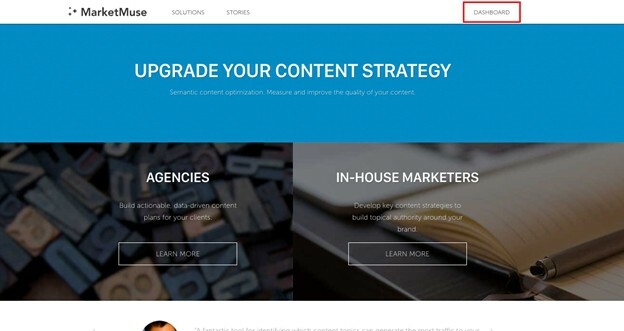 You now have a team to start managing the creation of your content for your sites! So now that you’ve got your Virtual assistant, you can start thinking about Content Creation. 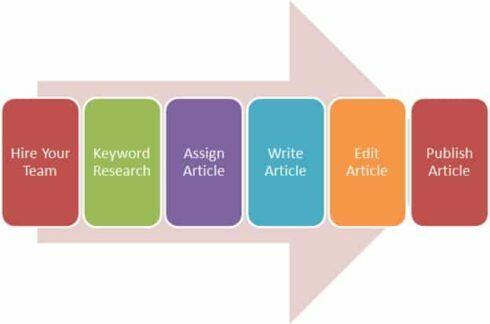 The first obstacle is finding solid Keywords and Article Titles for your articles. This is a process that we have nailed and it’s really simple. As I mentioned above, Long Tail Pro University is a great way to educate yourself on how to use the tool properly or you can follow this simple guide on how we conduct solid Keyword Research. To give you some background, LTP has a few different subscription options that you can choose from. You can read more about the differences between each package here. If you are unsure about buying LTP, you can also sign up for their 10 day free trial. Step 1: The first thing you do once you have LTP is set up a new project. You can do this by clicking on the green Add Project button. Step 2: Now that you have a new project, you are able to find some keywords to analyze. You want to click on Find Keywords. Here you will have the option to add your own keywords or add Seed Keywords. 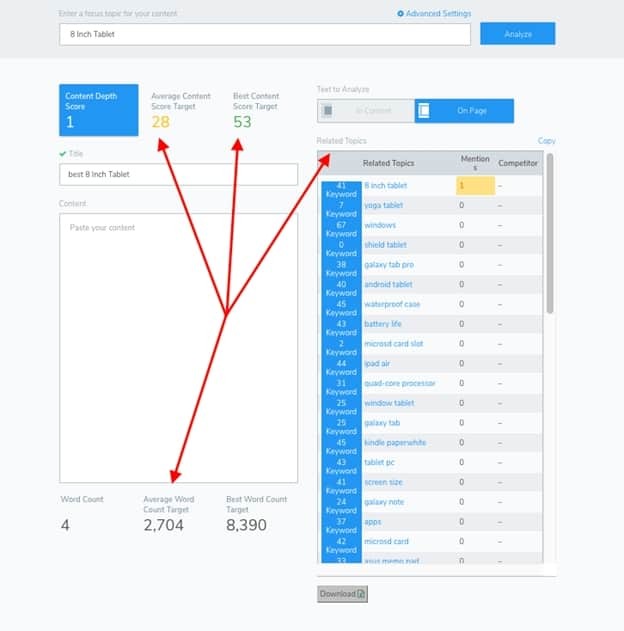 If you add your own keywords, it will only analyze those keywords, however if you use the Seed Keyword section, it will find keywords related to the keywords you type in. I like to use the Seed Keyword option as it will bring up keywords you may not have thought of and it will widen your search. Then click Retrieve Adwords Suggestions. Step 3: Now we will need to do a competitor analysis. What makes this option the quick and easy option is that it gathers all the metrics for each keyword for you! What you need to do is click on each keyword one by one. You will want a place to keep this information, so I have created a document that you can download to help you organize your information. Another good feature that LTP has is the ability to download the keywords you find into a .csv file onto your computer so you can open it up in Excel. This makes it easier for you as you will not need to type out all the keywords along with their titles, Suggested Bid, and Local Searches. If you have Long Tail Pro Platinum, it will also give you the Avg. KC. As we can see from our analysis (green=good), this keyword meets 5/5 of the metrics we wanted, so this would be a good keyword to go after. 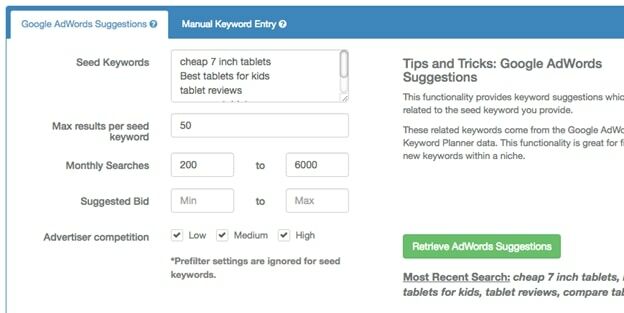 After you have your main keyword (keyword with over 1,000 monthly searches) you will then want to find some long tail keywords relevant to your main one. These will help to generate traffic (in turn more income) to your site and allows you to tie in more products to your site. So now that you’ve got your keywords, you can start thinking about Content Creation. Once you have your keyword that fits within these metrics, you want to create an article title that has the main keyword in it, generally at the beginning of the title. For example, if the keyword is “Survival Tents”, you want the title to be something like “Best Survival Tents for Winter Camping”. Now, I believe that this part of the process is where we really stick out and where we have really invested in the quality aspect of our content. As you probably are already aware of, Google ranks content based on a number of different metrics. There is so much garbage and terrible content on the Internet that google wants to reward websites who have the best content to encourage quality content creation. One measure that Google will take is the “In-Depth” article metric. The idea of this is to ensure that a piece of content covering a topic isn’t simply stuffing the article full of low competition keywords, rather they are discussing several topics that broadly cover the “Focus Topic” to give the reader a better understanding and therefore rendering the article more useful to the reader. This is all about LSI keywords and the Hummingbird update (Neil Patel did a great case study here). So how do we make sure topics are being covered thoroughly? It is difficult for writers to have the knowledge base on every topic assigned for them to cover it “thoroughly” and with accordance to what Google believes is “thorough” and “ in-depth”. To address this problem and in order to setup our writers up for success, we invested in a really great tool called MarketMuse. 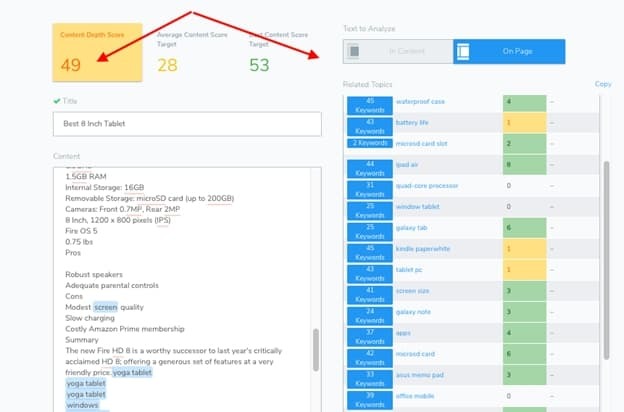 MarketMuse is a piece of online Software that allows you to grade your content by comparing it against other high ranking posts on on the same “Focus Topic”. It will help if you assign your articles to your writer and ask them to include topics and other keywords that will lead to different content opportunities. What we’ve done, is we’ve basically built a brief for each article based on MarketMuse outputs with subheadings and sub topics that will guarantee that our writers won’t miss the ball on the article in terms of content depth. 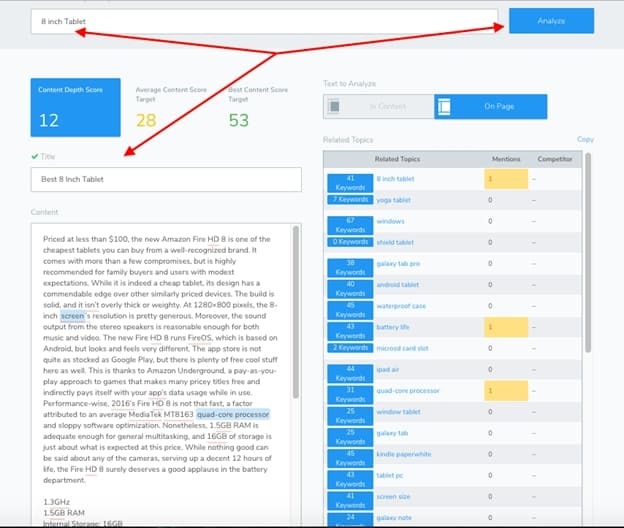 From the Screenshot, you can see that the Focus Topic has been analyzed. Three Metrics from this screenshot will help me determine my approach for my article on this topic. This is keyword research going beyond what keyword research tools reveal and actually showing how competitive the top pages are in terms of the likely quality of their content. MarketMuse will output a list of “related topics” that should be mentioned in the article. Copy this list to be able to provide it to your writers. This isn’t a huge factor for us, but definitely helps us figure out how long our article should be in order to compete online. So with these metrics in mind, check out the Review Article Brief that I would send to my writer for this article here! Moreover, including an appropriate word count in combination with the suggested keywords and topics, will almost guarantee that your writer will cover the topic properly and that your article will be of high ranking potential. 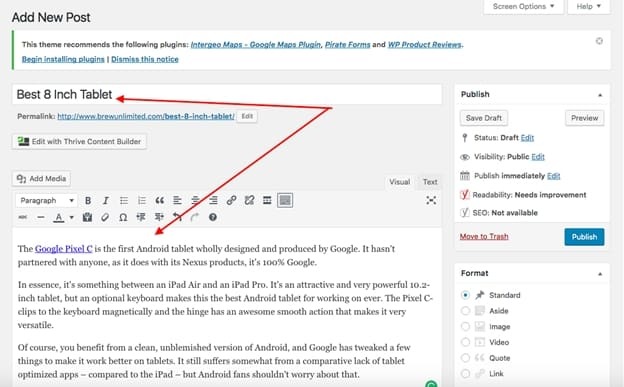 Based on the instructions provided in the section above your writer now writes the article. Now do not fear! If your writer didn’t follow the instructions properly while writing your article, you can still salvage it and enrich it using MarketMuse. This step by step guide will show and explain how to use the tool MarketMuse to create better, more valuable and in depth content for your website! Step 4: It might take a minute or two to analyze, but at the Final analysis should look like this. I’ve pointed to the Content Depth Score, the Average Content Score Target and the Best Content Score. Step 6: Now this is a judgment call. IF you feel like the article is badly written or has not been written by a native english speaker ( Basic grammar + sentence structure issues, odd choice of words etc..) you should probably have it re-written by another writer just throwing out the bad article. Step 7: After you’ve read the and corrected the errors in the articles, you’re going to look on the right side of the page and look at some of the keywords+topics listed. 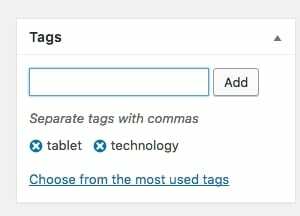 Step 8: Without “ Keyword Stuffing” or inserting Keywords that are unrelated, start going through the article and adding suggested keywords where they fit and add value. You will see that it is really easy to get the article up to well above average by just adding a few value added sentences addressing any keywords mentioned. Step 9: Now that we’ve got our content up to a reasonable standard by just using different words, take a look at the missing words on the list of keywords. They will generally identify a missing subject from the article. Here you can see that the writer didn’t think to include anything about Android tablets which is clearly an important thing to mention if the keyword is high up on the list. This is where your chance to do some content writing fits in. Simply add in a small paragraph that talks about windshield insurance. It doesn’t have to be extensive. DONE! You have a great article ready to be published! If you don’t know how to edit with thrive look at these tutorials! They are super useful and will help you figure out Thrive, which is in my opinion the one stop shop for WordPress publishing! You can do this with different sites such as About.com or any other general authority sites. Step 5: Publish your article! Once you are done, publish your article and make sure that they YOAST scores are either yellow or green! Although this all seems pretty straightforward (which it is), one thing we haven’t really talked about is cost. Unfortunately, the tools that we recommend using in order to have a competitive advantage are quite pricey, and it really only makes sense for people who are crushing out massive amounts of content and really making a business out of their websites to invest in these tools. LongTail Pro Pricing: Depending on the package you get, you’re looking at between 30-100 dollars/ month for the Keyword Research tool. MarketMuse: Again, depending on the package you get, you’re looking at spending between 200-500 dollars/ month for the Marketmuse tool. Paying your writers and your VA’s: To get a good writer, you’re looking at around $50 an article and to get a good Virtual assistant you’re probably looking to spend between 5-10 dollars an hour. In total, if you’re doing this yourself you’re probably looking at around 500-800 dollars a month for solid content creation for one website. This doesn’t even include images if you’re sourcing from a stock image account. There are ways to not do everything outlined in this guide and you will be able to save money. There are a few moving parts in this process that all need to be managed. Getting someone on your team responsible for the overall management of the process including the keyword research and publishing can add a lot of time/cost/complexity to the process. If you are needing articles right away it can be very slow to get this entire process setup. This blog post was to give you insight into the exact process we have for content creation so that you have the resources and information at your fingertips to build out a similar system for your own sites. We hope all the article brief templates shared will be helpful! 7 of our KEY templates all shared for free! Steal Them All While They Are Available! All this free information I am sure will provide a lot of value to many people within the NichePursuits community. However, for those that are looking to scale their business or find a method to get great content created we have a special offer for you! NichePursuits Audience Receive 10% Off! ContentRefined.com has scaled rapidly since its launch and now delivers a couple hundred great quality posts per month to clients with Affiliate Sites, ECommerce Sites and SaaS businesses. At ContentRefined we are a marketing first focused content creation service that does everything for you from advanced keyword research through to blog post publishing. Make sure to use the limited coupon code “spencer”! 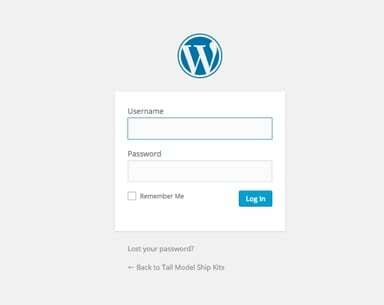 SquareSpace vs WordPress: Which Should You Use For Building Your Website? Wow! This article is very informative. I also struggle with getting quality content created. Building a team up like this is something I seem to be missing. I always have issues with flakey writers and hiring writers who are native english. Thanks Jon and Spencer for sharing this! Solid. 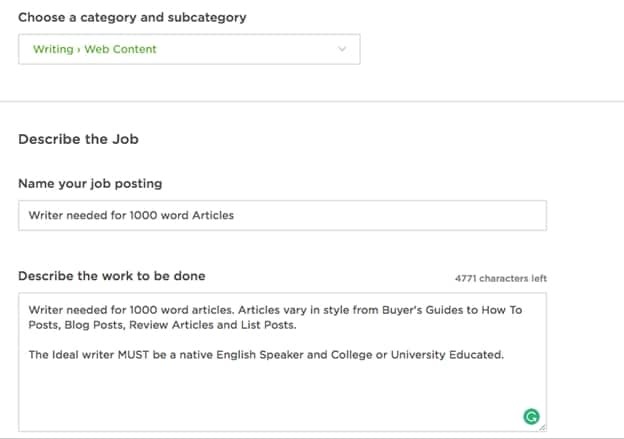 I agree with upwork, but it’s hard to screen for good writers quickly. Hirewriters is a littler better imo. Everything else is great though. Much cheaper to get good logos and art on upwork. Great article, thanks. You use H3 for your subtitles? I’ve always used H2. Also, you should mention that keywords should be included in the headings. Hey Mike, this was my bad! Sorry about that and it has been fixed. You can now get access to all the files and any updates the contentrefined team does in the future to those procedures. Hi Waqas, the link has been fixed. My apologies for my mistake. Hi Alan, thanks for flagging this. This was my mistake. I have fixed it so you can now acces the folder and get all future updates etc. Awesome article – always good fun having a look at behind the scenes of someone else’s gig. 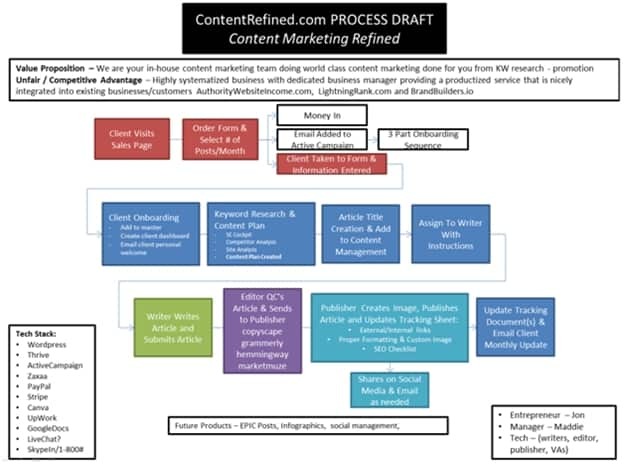 You have nailed the process system – I might have to look into your content offer !! Great share by Jon, he always provides good content on his blog as well, and his SOP and script templates are some of the best for outsourcing. Good article but do you really think a good writer costs $50 an article ? I would expect $20 per 1000 words would get decent content. Thank you , its really important post for me. I was worry for my Niche site content. I want to hire Someone for that content, but always worry for content value. 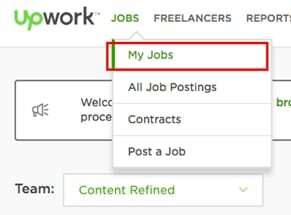 But after reading this article i am now clear how to Content Creation from freelance market such as upwork. Thanks Nichepursuits for help me to give most helpful Ultimate Content Creation Guide idea. Thank you so much for the great article. Very useful tips for hiring a writer and analyzed content. Marketmuse is a really good tool to make article quality full. In the keyword research section, you mention page authority as one of the criteria for selecting keywords. Is page authority the Trust Flow or the Citation Flow column in LTP? Just FYI, I’m having a little bit of success with writers on Upwork, as well as a whole lot of success using Upwork for creating more in-depth resources and materials for my niche. Textbroker on the other hand, was a disaster. It’s a great article, thanks. Trust Flow and Citation are similar to PageAuthority and Domain Authority. Great tips Jon! But I was wondering, how do you make sure the content written by the writer will have the same voice and writing style as you? Excellent article. I really like the detailed suggestions for directions for prospective writers. I have found a few cheap writers and this will help me get a little bit better quality from them. Thanks. I think it should be Monthly Searches Max: 6000. Thanks for the insight, great post thanks! Awesome post guys. I have followed both of you for years, and it’s crazy to me that you’re still able to provide a fresh perspective on how to get things done. I’ve never heard of the MarketMuse before, that was really interesting to consider. Very intresting! Sure I will use some of these ideas in my next post! I have hired a content writer lately. Experience is ok. They do average work. I will be looking for high quality content now. However, for me, sometimes I don’t have time to sit down and create content around a particular keyword. Luckily I found a perfect solution called answerthepublic. It’s a program that dishes out content ideas based on the keyword. You should give it a try! Wow! It is surprisingly similar to what I have been doing. I started hiring writers on Upwork one year ago and began with 9. Nowadays I have only 2 and am very happy with both of them.